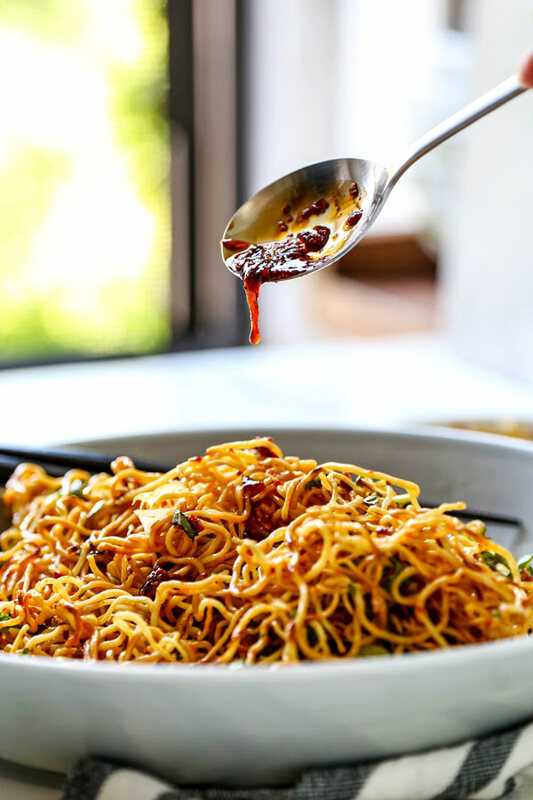 These Pan Fried Noodles With Tangy Chili Crisp Sauce may just be the Chinese noodle recipe you’ve been waiting for! Blanketed with herbs and plenty of smokey, pungent, fragrant heat, this pan fried noodles recipe is ready in under 20 minutes from start to finish! Back when I lived in Hong Kong, I was absolutely spoiled for food options. The days that my schedule was full of auditions and bookings were my favorite – because they would take me to all corners of that sprawling, vertical city. And you better believe I was always on the lookout for food! Yep, without fail, I would have one eye on my map (this was before Apple maps lol), and the other trained on all the restaurants that silently beckoned me in for a taste. Trust me, no matter how full my schedule was, I ALWAYS found time for lunch! It was on one of those hurried and delicious lunch breaks, in a restaurant that smelled almost too good to be true, that I first tried Chinese pan fried noodles with hot chili oil. And, let me tell you, I was hooked from the first crunchy, chewy and spicy bite! Now, enough time has passed that I don’t remember if I made it to my next casting on time. But I wouldn’t be surprised if I showed up a little late. You see, I absolutely DO remember taking my time and savoring each bite of those impossibly delicious noodles. This happened to be one of those transformative experiences with food – where you try something new, and want to dissect and savor every little nuance of the dish. Food can be so exciting! I walked away from that meal promising myself I’d try to make something similar at home. Sure, my own homemade pan fried noodles with tangy chili crisp sauce differ in many ways from a flavor perspective. 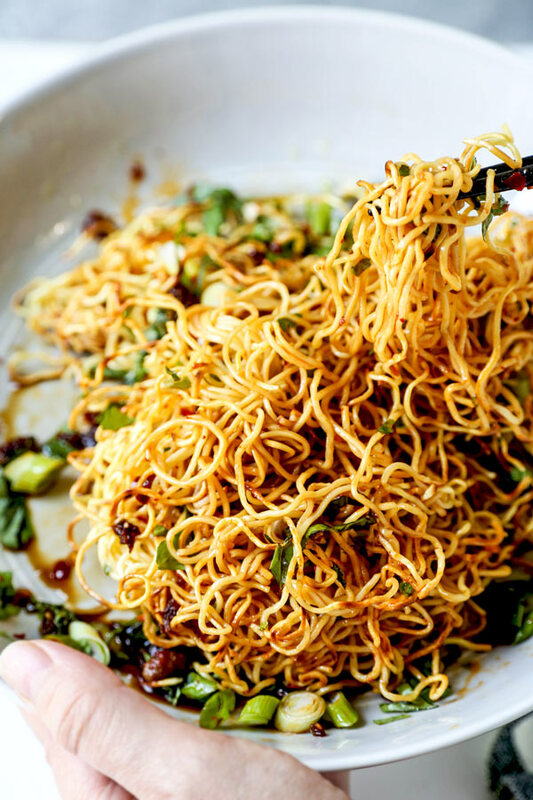 But the spirit of the crispy fried noodle cake from that magical meal in Hong Kong lives on! I’m super excited to share this recipe with you today, friends! 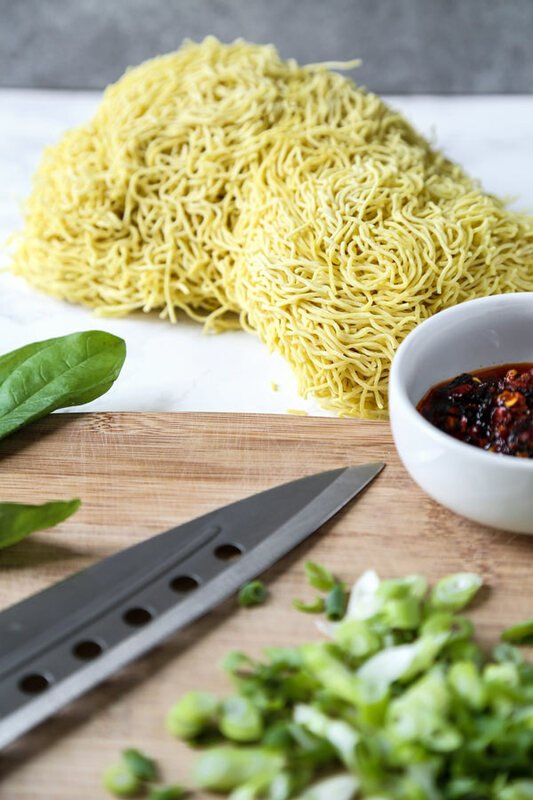 Not only are these pan fried noodles packed with bold spicy and fragrant flavors – they differ, texturally speaking, from most of my other Asian noodle recipes on the blog. Are they crispy? Check. Chewy? You bet. When Ben saw these noodles, he was more than a little intrigued. And, after a taste, he got pretty aggressive with his chopsticks, trying to eat all the noodles (a good sign to be sure). No need to tell him that it took me less than 20 minutes – and a relatively short ingredients list to complete this recipe. Heck, chopping the fresh herbs for the verdant topping was probably the most labor intensive step of the day. And that isn’t tough by any means. But, I guess when you’ve got chili crisp doing the heavy lifting in the flavor department, everything just seems a bit easier. 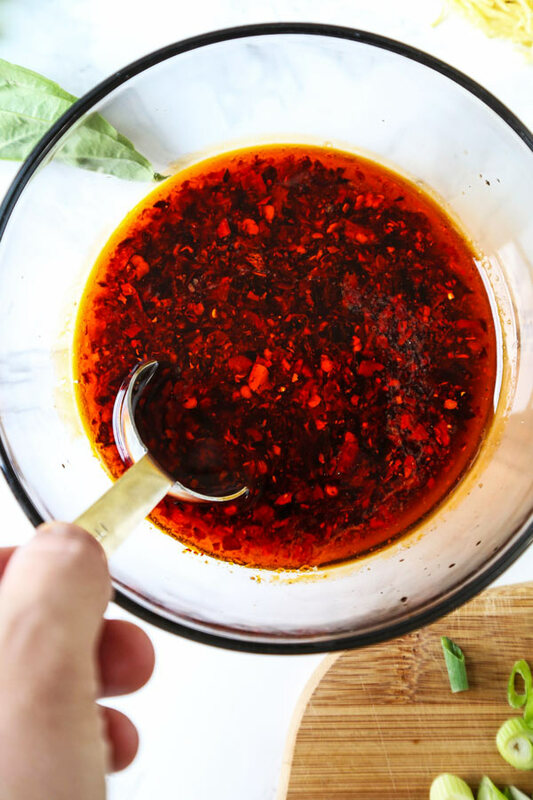 Chili crisp is a punched-up wonder condiment that is composed of Chinese chili oil that has been long simmered with spices, chilis and Sichuan peppercorns. It is then packed with fragrant fried garlic, fried onions and roasted fermented soy nuts for even more flavor and a crispy, crunchy texture. The resulting chunky oil has a bit of of funk and heat, mixed with an almost numbing quality – that also happens to be heavy on the browned goodness that you only get from perfectly caramelized garlic and onion chips. It’s rare that a condiment comprised of so many aggressive flavors can also manage to be so well balanced. I mean, on their own, most of the ingredients in chili crisp would provide a kick – so it’s a revelation that, through excess, a real balance of flavors is achieved. But, aside from being an out-of-this-world condiment, chili crisp works super well as an ingredient inside a composed dish. Heck, it’s one of the main flavor agents in my vegan mapo tofu (麻婆豆腐) recipe. It’s also what makes today’s Chinese noodle recipe really pop with well rounded and aggressive flavor. 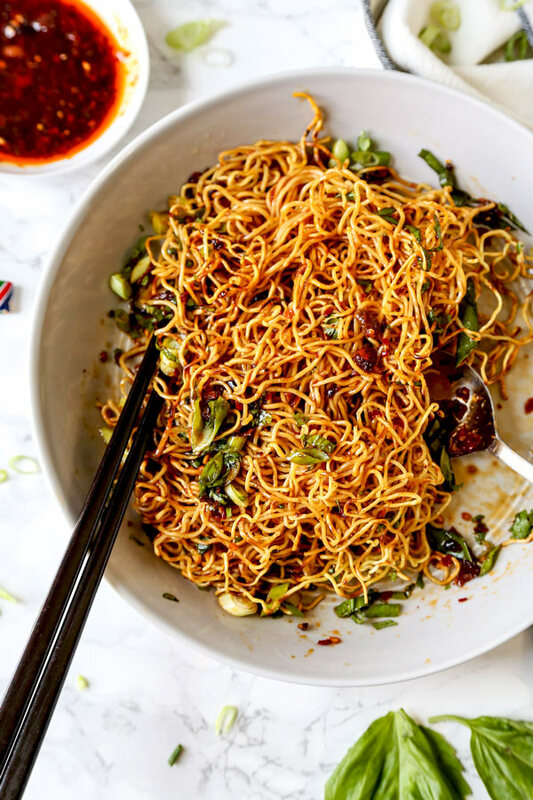 If you love smokey, funky, fragrant heat, this may just be the pan fried noodle noodle recipe you’ve been waiting for! So, what are Hong Kong style pan fried noodles? 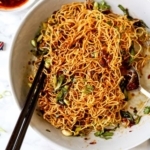 You’ll find the noodles you need for this recipe either labeled as chow mein noodles – or Hong Kong style pan fried noodles. Either way, these are a Chinese egg noodle (not to be confused with the similar looking wonton noodle) that have been parboiled and dried before packaging. 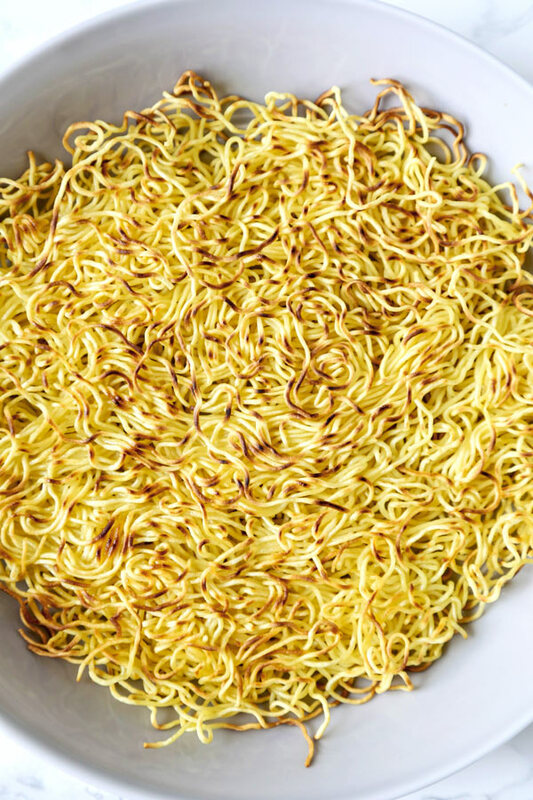 When preparing your chow mein for this pan fried noodles recipe just keep in mind that, since the noodles are partially pre-cooked, you won’t want to go overboard and boil them for a long time (more on that in a sec). 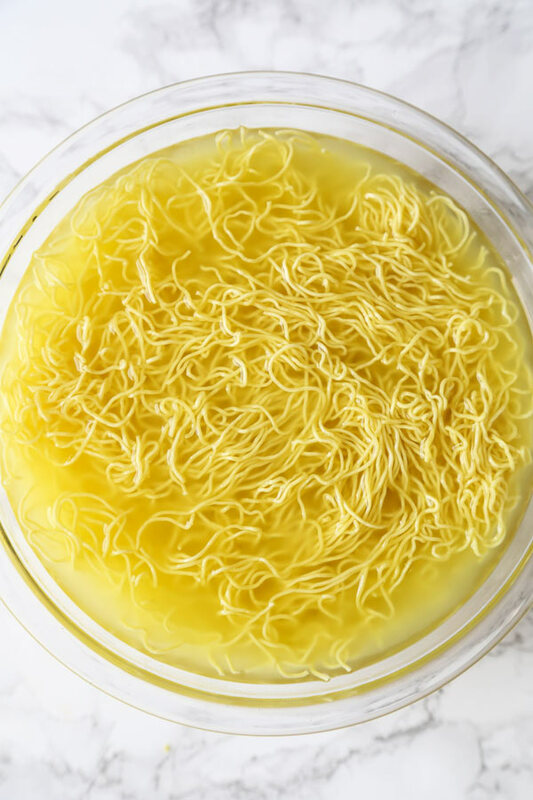 After a quick dunk in hot water – and a good draining, Hong Kong style noodles will crisp up super well in a hot pan with a little oil. You should be able to find chow mein at most Asian grocery stores without too much trouble – or just pick up your chow mein on Amazon. Now, as it sometimes goes when experimenting with new foods, it can get super confusing with all the different types of Chinese noodles out there. Well, an oversimplification of the differences between chow mein and lo mein is that pan fried noodles (or chow mein) are delicate and thin egg noodles that have been parboiled before packaging. These are the noodles that we are making the crispy noodle-cakes out of in this recipe. Lo mein noodles are thicker and much more dense. These noodles are typically boiled and then stir fried with heavier sauces – along with meat and veggies. They also tend to be the noodles we most associate with with Chinese delivery dishes when it’s a Seamless night. So, when the subject of pan fried noodles vs lo mein comes up: just keep in mind that lo mein is going to go well with stir fried and heavily sauced noodle dishes – and Hong Kong style pan fried noodles (chow mein) are going to crisp up nicely in our wok! Let’s get down to the business of cooking, shall we friends? It’s my favorite part of any post. 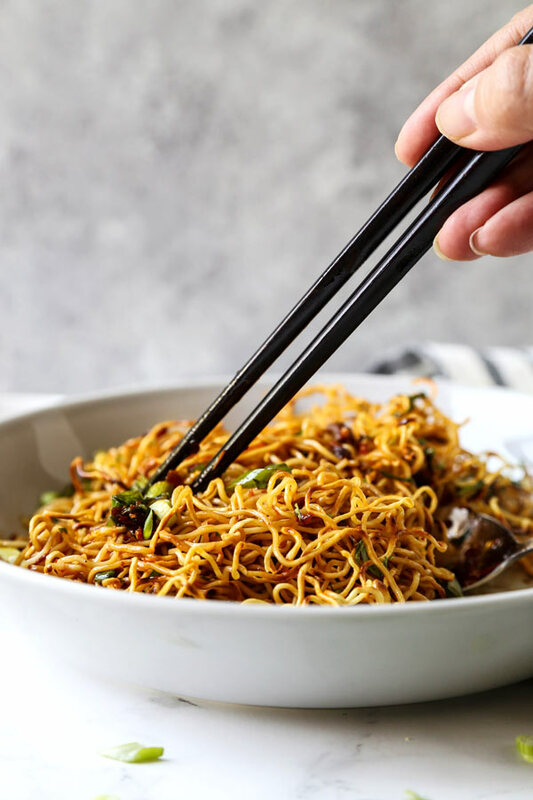 Yep – this is where I get to show you just how easy it is to prepare this tangy and spicy Chinese pan fried noodle recipe in your own home kitchen! So, without further ado, mix two tablespoons chili crisp with two tablespoons of chicken broth (or vegetable broth) in a bowl. Add two tablespoons of soy sauce and a tablespoon of chinkiang vinegar – mix well and set aside. We’ll need that soon! Then prepare your chow mein noodles according to the directions on the package. NOTE: some brands will call for a dunk in boiling water. Others will call for a soak in a bowl, covered in hot water. When in doubt, I soak in hot water until they have softened – yet still have a good chew to them. Drain and rinse well. Now, divide your cooked and drained noodles into four separate bunches. Get a bit of vegetable oil going in a flat bottom pan or sloped wok over medium-high heat. 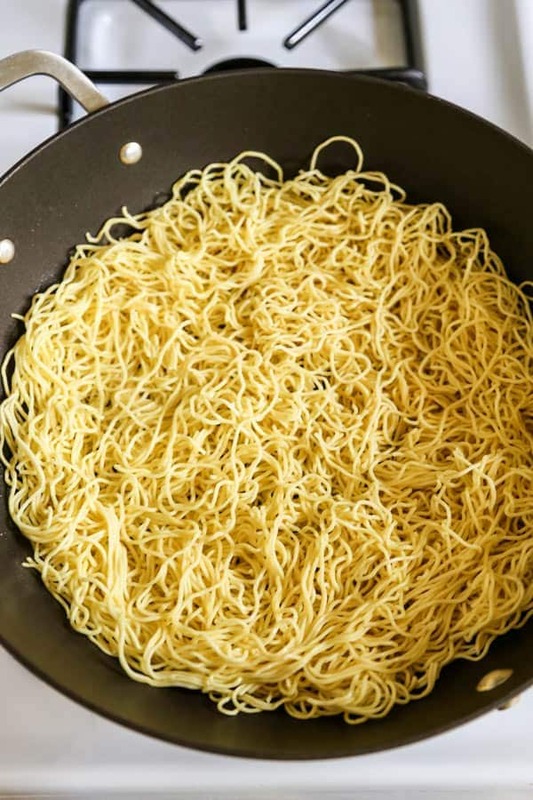 When your pan is hot, take one bunch of Chinese egg noodles and place them evenly across the bottom of the pan – kinda like a pancake. Then flip your noodle cake and cook the other side. When both sides are golden (or leung mein wong), you’re ready to rock! Repeat with the remaining noodle bunches – then top with half (or a bit more) of your homemade chili sauce, chopped scallions, cilantro and basil. And there it is! Restaurant quality Chinese pan fried noodles – made with ease at home. Is this Pan Fried Noodles recipe vegetarian? If you stick to this recipe (and use vegetable broth instead of chicken broth), then yes – this is a vegetarian recipe. The outsized tangy, spicy, salty and herbaceous flavors in this recipe are totally at odds with the short ingredients list. I’m a HUGE fan of vegetarian recipes that pack real wallop. However, since we’re using Chinese egg noodles here, this isn’t a vegan recipe. Normally, this is the spot where I’d give you a vegan alternative for the noodles. Alas, this is one of those recipes that absolutely relies on the egg noodles. You see, the chow mein egg noodles are the only noodles I’ve had any luck crisping up and making a crunchy and chewy noodle-cake out of. That said – if you’re not stuck on the whole pan-fried-noodles-thing, the savory and spicy sauce from this recipe would go very well mixed with cooked rice noodles. Now – if you’re following the omnivore’s path, it must be said that chicken broth goes quite well in place of the vegetable broth in the sauce. I tried it both ways when developing this recipe – and I’ve gotta say that I slightly preferred the version with chicken broth. 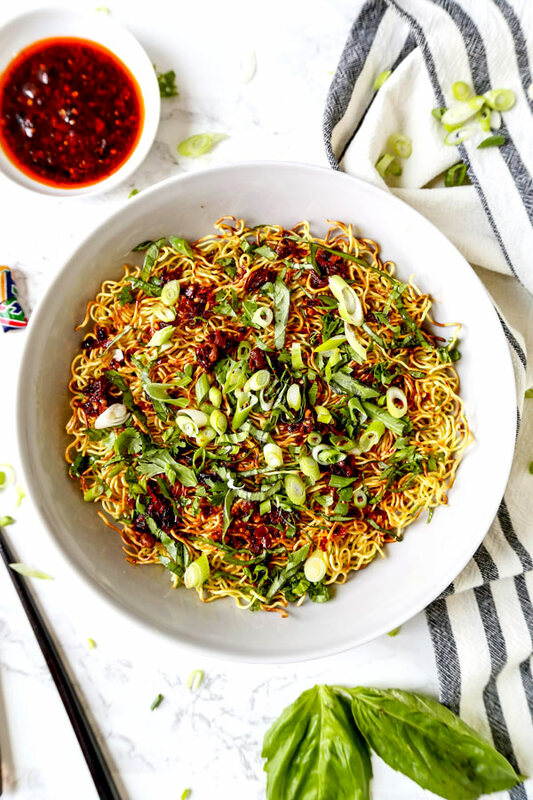 I hope you love these delicious pan fried noodles with tangy chili crisp as much as I do! For me, the smoky, spicy fragrance in this crunchy noodle dish is reminiscent of food discovery in a far away land. And, it’s so easy to make, it almost feels like you’re cheating in the kitchen. All hail the mighty chili crisp! How about you? What’s an ingredient or condiment you use in your kitchen that adds unreal, outsized flavor to your food creations? I’d love to hear all about it in the comments! Did you like this Pan Fried Noodles With Tangy Chili Crisp Sauce Recipe? Are there changes you made that you would like to share? Share your tips and recommendations in the comments section below! A simple savory recipe for pan fried noodles – and vegan too! Mix all the ingredients for the sauce in a bowl and set aside. Prepare your chow mein noodles according to the instructions on the package. Drain well and separate your cooked chow mein noodles into 4 equal bunches. In a large pan over medium-high heat add vegetable oil. When the oil is hot, add one bunch of your noodles and spread evenly across the bottom of the pan like a pancake. Fry the noodles for 3-5 minutes, until they become browned and crispy – then carefully turn them over. Fry on the other side for an additional 2-3 minutes until both sides are golden brown. Transfer to a plate and repeat with remaining noodle bunches. Drizzle cooked noodle ‘cakes’ with about half of the sauce. 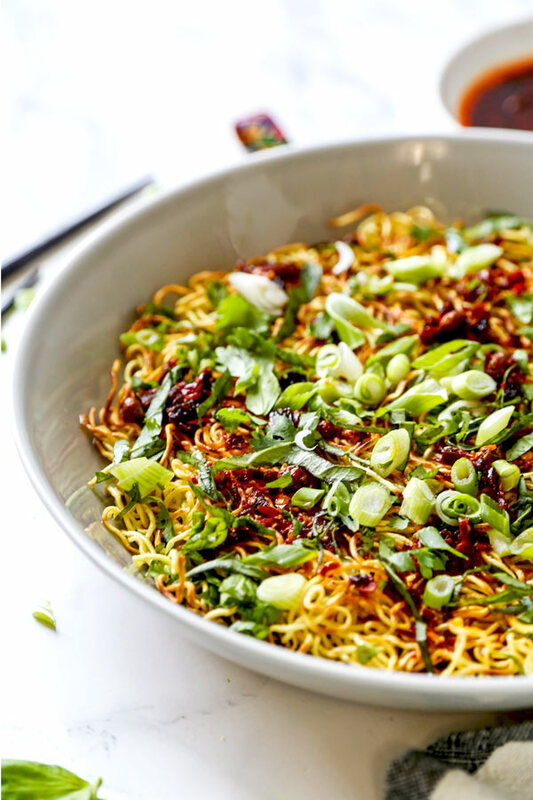 Top noodles with cilantro, basil and scallions – and serve with remaining sauce on the side. These pan fried noodles are best when served immediately. They can keep in the fridge for a day but the noodles will no longer be crispy. Omg this turned out so nice and it’s so cheap to make too! Thanks for sharing this recipe, I’ll be making this again and again. That’s so great Andrew! We love this recipe quite a bit too and make it whenever we feel lazy in the kitchen :)! Just wondering whether I could make chilli crisp at home? Or buy ingredients separately? I couldn’t find it in the supermarket. Thank you.